According to the non-profit Tax Foundation, the average effective income tax rate for all U.S. households is 18.1%. That is lower than the highest marginal rate paid by most year-round workers, (at least 25% for any individual with an adjusted gross income of more than $36,901)—but it also doesn’t capture the full picture. For the typical tax payer, state and local taxes on income, purchases and real estate can be almost as burdensome as federal income tax. Use our free income tax calculator to calculate your tax burden. To find the cities with the lowest taxes, SmartAsset looked at tax data for every U.S. city with a population of at least 250,000, and calculated the expected tax bill for a typical income-earner in that area. We considered the three most significant taxes paid by middle-class Americans: income taxes, sales taxes and real estate taxes (also called property taxes). For every city in our study, we projected a tax bill for a hypothetical tax payer earning $45,000 a year (the median U.S. income for full-time, year round workers), who owns a home worth $270,000 (the average home value for major cities). Based on our analysis, these are the fifteen best cities for middle-class taxpayers. Three. That’s how many of the top ten low-tax cities are located in the state of Florida. The state has no income tax and low sales taxes, especially as compared to other no-income-tax states. Zero. That’s how many Midwestern cities landed in the top third of the cities in our study, and several landed in the bottom ten, including Milwaukee, Wisconsin; Columbus, Ohio; and Lincoln, Nebraska. 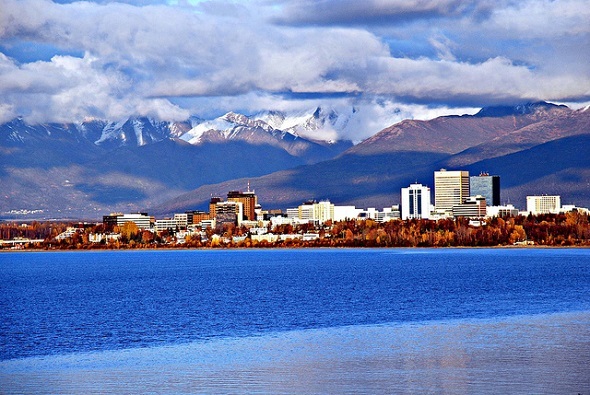 The crown of Lowest Taxes in America goes to the northernmost city in our study. The state of Alaska is well-known for its taxpayer friendly policies, particularly the “Permanent Fund Dividend,” an annual payment sent to state residents who have lived in Alaska permanently for at least one year. The dividend’s amount varies year-to year, ranging in recent years from around $900 to over $2,000. While the city of Anchorage can’t quite afford to pay its citizens to stay put, it still manages to keep taxes low. The city has no income or sales taxes, and its effective real estate tax rates are lower than major cities in the lower 48, including Chicago, Baltimore and Minneapolis. This may be in part because of the exemptions afforded veterans and seniors, who don’t have to pay taxes on the first $150,000 of their home’s value in Anchorage. All three Floridian cities with a population of at least 250,000 ranked in the top ten of our study, which is indicative of the state’s across-the-board low tax rates. Florida collects no income tax, and its state sales tax of 6% is significantly lower than any other no-income-tax state. We found that Tampa’s effective real estate taxes (that is, tax rates as a percentage of actual home values) are lowest of Florida’s major cities, just below Jacksonville and Miami. The largest city in Florida, Jacksonville’s low taxes make it one of the most affordable big cities in the country. In general, Florida is one of the best states for retirement, so soon-to-be retirees who are interested in living in a major metro might want to give Jacksonville some consideration. And here’s one other reason the tax-averse might like the Sunshine State: Floridians pay no state inheritance tax. During fiscal year 2014, the state of Nevada collected over $700 million in gaming taxes from casinos, in addition to $139 million in live entertainment taxes and $15 million in liquor taxes. In total, contributions from the casino-hotel industry accounted for 47% of the state’s general fund revenue of $2.8 billion. That, in part, explains why the people of Henderson pay no income taxes to their state, county or city government each year, and enjoy one of the lowest tax burdens in the country. Unlike the other top 5 low tax cities, Honolulu is in a state that collects income taxes and sales taxes. So why is it ranked so high? The key is low real estate taxes. While most major cities collect about 1% of home values in annual real estate taxes, Honolulu collects less than a third of a percent. That means that, for the hypothetical taxpayer used in our study, real estate taxes in Honolulu would total under $800 per year—far less than in any other city. While Seattleites face among the highest sales tax rates of any city in the nation, totaling 9.5% between state and local taxes, much of the money they lose at the cash register is regained on tax day. That’s right: there’s no income tax in the Evergreen State, and while there have been proposals over the years to enact a state income tax, those efforts have consistently fallen short. Located in Colorado’s El Paso County, Colorado Springs has long been recognized for both its natural splendor and for being an ideal city for families. The state and local tax environment offer support to parents raising a family in Colorado Springs, most notably the Child Tax Credit. This state tax credit varies between 5% and 30% of the analogous federal tax credit. For our hypothetical taxpayer (earning $45,000 per year), the credit would be worth $150 per year, per child six years or younger. While a trip to Vegas may spell doom for a tourist’s wallet, a move to Vegas could save the average taxpayer a bundle of money. Residents of Sin City pay no income taxes, a sales tax rate of 8.1% and effective property taxes of about 1% of a home’s value. While Arizona’s top marginal tax rate is 4.54%, that applies only to taxpayers making over $150,000 per year. Anyone earning less than $50,000 a year faces a top marginal rate of just 3.36%, and an effective rate closer to 3%. At first glance, it would be easy to think that Washington, D.C. has among the highest taxes of any city in the country. After all, its top marginal income tax rate of 8.95% is 7th highest in the country. That rate, however, only applies to income earned after a taxpayer’s first $40,000 of earnings, which in practice means that middle-class taxpayers pay a far lower rate. The District also helps middle-class homeowners with its “Homestead Deduction” on real estate, which reduces taxable value of eligible properties by $70,200. The largest city in Orange County, Santa Ana offers lower sales tax rates and real estate taxes than many other cities in Southern California. The city’s combined state and local sales tax rate of 8% is a full percentage point lower than that of nearby Los Angeles, saving a typical middle-class taxpayer about $250 every year. The state of Louisiana has some of the lowest property taxes in the country, and New Orleans is no exception. On average, homeowners in the Big Easy pay just 0.7% of their home’s value in real estate taxes every year. 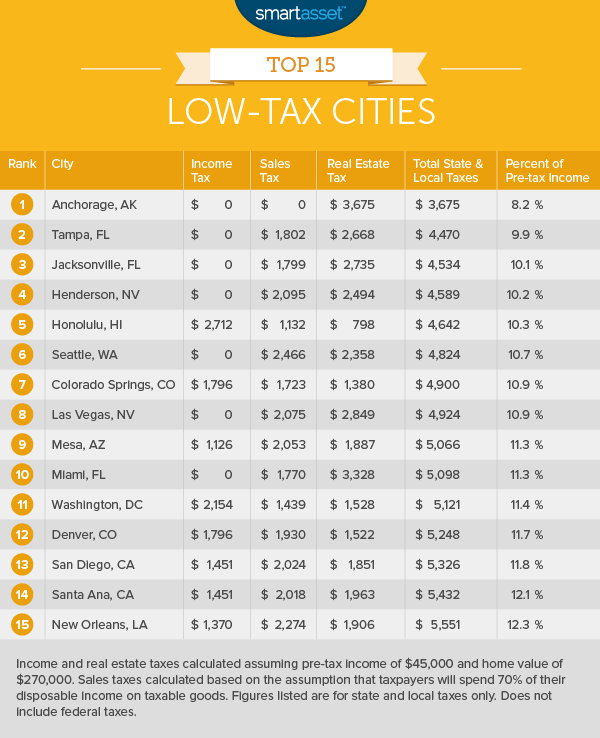 To find the cities with the lowest taxes in America, we calculated taxes for a hypothetical taxpayer who earns $45,000 in income annually and owns a home worth $270,000. We first calculated income taxes by removing each state’s standard deduction at that income level (e.g. $3,992 in California), and then applying each state’s tax rates to the applicable levels of income. For cities which have their own income tax (like New York City), or are located in a county with an income tax (like, for example, most counties in Iowa), we then did the same at the city or county level. Next, we estimated the real estate taxes the taxpayer would pay by applying the effective real estate tax rate in every city in our study. The effective rate is total real estate taxes paid as a percentage of the actual home value, as opposed to the listed rate, which is a percentage of “taxable” value, a figure that is calculated differently in every city according to varying sets of rules. A financial advisor can help you devise a tax-efficient financial plan or work with you on specific tax issues. A matching tool like SmartAsset’s can help you find a person to work with to meet your needs. First the program will have you answer a series of questions about your situation and goals. Then the program will narrow down your options from thousands of advisors to three fiduciaries who meet your needs. You can then read their profiles to learn more, interview them on the phone or in person and choose who to work with in the future. This allows you to find a good fit while the program does much of the hard work for you. You can also plan ahead for tax season by calculating how much you’ll owe. SmartAsset offers several tax calculators, including a federal income tax calculator and a property tax calculator. Questions about our study? Contact us at blog [at] smartasset.com.